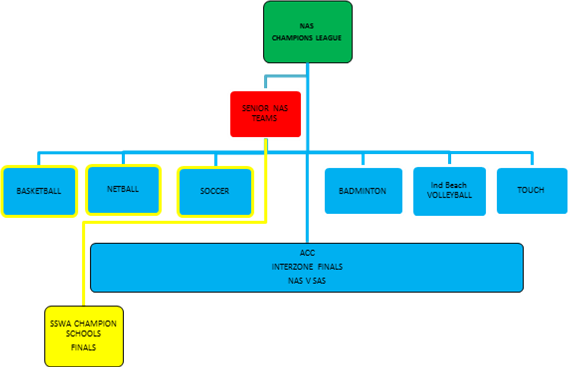 Commencing in 2013, the NAS competition will start a new era with the launch of the "Champions League". All NAS senior level competitions that have the option to feed into a higher level competition will be referred to as "Champions League" grades. In senior basketball, soccer and netball the winning NAS school will move directly into the knock out finals stage of the School Sport WA (SSWA) Champion Schools competition. This will offer NAS schools a pathway to challenge for the title of WA Champion School. In senior sports where there is no SSWA pathway the top NAS school will still have the opportunity to play off in the ACC Interzone Final versus the Southern Associated Schools (SAS). The following sports will play ACC Interzone NAS V SAS finals; indoor beach volleyball, touch and badminton. Basketball, soccer and netball will play Interzone Finals and SSWA Champions Schools Finals.